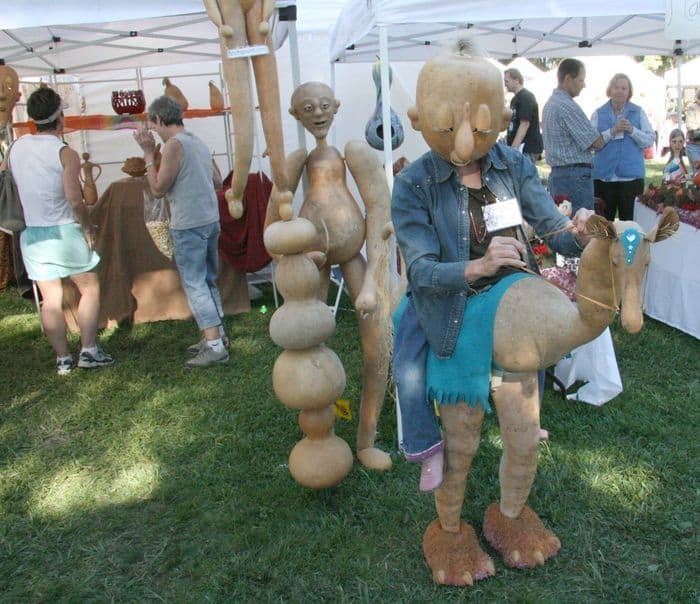 The Folsom Gourd and Arts Festival starts this Saturday and carries over into Sunday, at Folsom City Park. It is the 15th annual Folsom Gourd Festival in Folsom, and over 150 artists offer their exquisite artwork during this two day event. The festival includes gourd craft, art, entertainment, and food. Many vistors come for classes and demonstrations by well-known artists, who teach many different gourd art techniques. Last year, 4,000 visitors attended the two day event. This year, the support of four non-profit groups is expected to make it even more successful and interesting. Raffles held over both days support the local arts community, and the Folsom Patrons of the Arts asked Folsom Lake Community Concert Association to run the raffle, supporting four local non-profits. 63 local businesses that support our community and local non-profits are providing gifts to be raffled off. Several Folsom Lake Community Concert Association also made donations for the raffle. The Folsom Lake Community Concert Association and Folsom Patrons of the Arts ask their members, neighbors and all festival visitors, to support these local business, who help make the festival possible. The support of these businesses helps the non-profits fulfill their missions. Anthony Sadeghi, owner of the Karma Cafe, on Sutter Street in Historic Folsom, said he is pleased to participate in community events and support the local non-profits. In addition to the hourly raffle prizes, there will be a silent auction on Saturday and anotehr silent auction on Sunday. Total value for the auction items is over $7000. 24 Hour Fitness 1008 Riley St.
Amber’s Aromatherapy 5302 Sandberg Dr.
Emily’s Corner 732 Sutter St.
Katrina’s Antique Ribbon 701 Sutter St.
Not Too Shabby 306 Riley St. Planet Earth Rising 625 Sutter St.
Rainbow Bridge Jewlers 721 Sutter St.
Safeway 1850 Prairie City Rd. Stage 9 Theatre 717 Sutter St.
Sunshine Clothing Co. 601 Sutter St.
Tasty Time 1870 Prairie City Rd. Veda Home 4356 Twn Cent Blvd. Zumba Fitness 9580 Oak Ave. If your business appears in this list, but I don’t have your website linked, please email the URL to me. Alan.